Why so many black Guitars? Discussion in 'Other Guitars' started by Bluzy, Feb 10, 2019. Depends on the guitar contours, and pickguard color as well. To me, and not just because its mine, it just seems to fit this guitar. Taurus, BlueSquirrel, squierbilly and 7 others like this. I got 1 and when I had a black one in the past I refinished it. The one I have now is a Epi LPC and I'll leave It black. squierbilly, drewcp, Davis Sharp and 4 others like this. The general argument here is that black guitars are bought because they are the most numerous and readily available. But that’s backwards reasoning, it makes more sense that they are more numerous because they are indeed most preferred. At my church, out of 8 electric and bass players, 5 of them play black guitars. I’ve asked around and they simply wanted a black guitar. For most people who only own one axe, black is the neutral and safe choice. When I was much younger I only ever wanted a black or white guitar and that’s what my first two electrics are. As I get older I prefer more variety, usually leaning towards pastel colours, then metallics. I own a black Strat, black acoustic and a trans-black Variax, and would never buy a black guitar again. dbrian66, Bluzy and porkpie like this. I like white guitars. But prefer darker cars. I don't like white cars. Color doesn't matter much to me. But check out GC, used Squires. The cheapest are all black. The only black guitar that I have is my 95 MIK standard squier strat, only for sentimental reasons. I like yellow, white, red, and the list goes on. dbrian66, Bluzy and Eddie like this. The only black guitar that I have is my 95 MIK standard squier strat, only for the sentimental value. I like yellow, white, red, and the list goes on. Yes, I prefer a bit of variation also. Maybe a yellow or an orange one in my future. I like my teeth white, and my coffee black. squierbilly, ElRey67, dbrian66 and 2 others like this. Too funny. Did you get the Player Series yet? I'm hankering to try it out. dbrian66 and Bluzy like this. It was rough when I got it ,but it cleaned up well ! Now this black one is a keeper and the 5 way switch makes this super Strat a freakin tone machine ! squierbilly, Pat V., ElRey67 and 3 others like this. This Squier SE is my only black guitar. I hesitated to do any upgrades to it because it was black. But after I replaced the white pickguard and plastic parts I found it worthy of a full upgrade. Tex Mex pickups, MIM bridge, new electronics, a Tusq nut and a blender pot. It turned out to be one of my favorites. I do like black Teles and Les Pauls more than black Strats for some reason. squierbilly, ElRey67 and dbrian66 like this. Black guitars are nice, but I like a variety of colors! squierbilly, Pat V., drewcp and 3 others like this. A lot of you have nice black guitars !!!! Pat V., dbrian66 and ElRey67 like this. ElRey67 and dbrian66 like this. I do not own any black guitars. It's my last choice. I just prefer, oh, anything but black! BlueSquirrel, squierbilly, squierTony and 2 others like this. I think the ebony Standards are classy looking too. Taurus, BlueSquirrel, squierbilly and 4 others like this. Davis Sharp, Bluzy and dbrian66 like this. 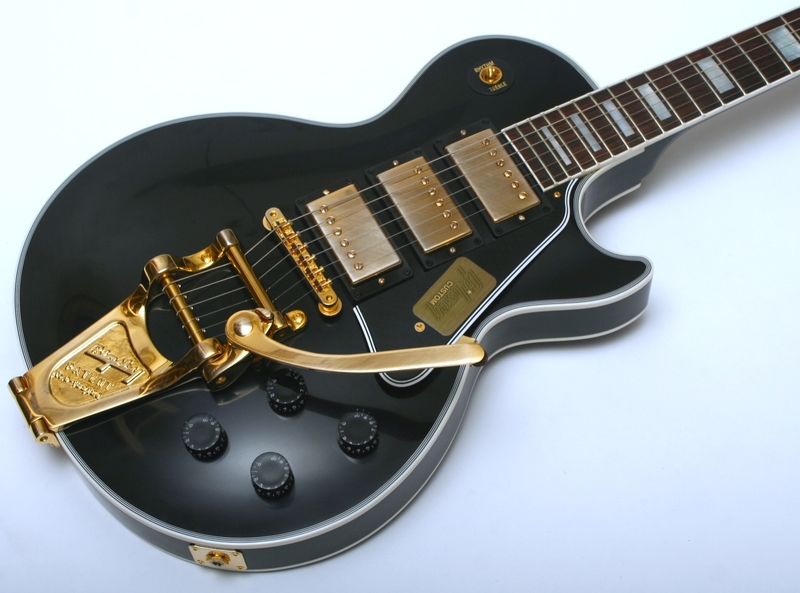 The only black guitars I have are Les Paul Customs. To my traditionalist eye, that's the color a Custom should be. That's just my thinking though. dbrian66, ElRey67 and drewcp like this. 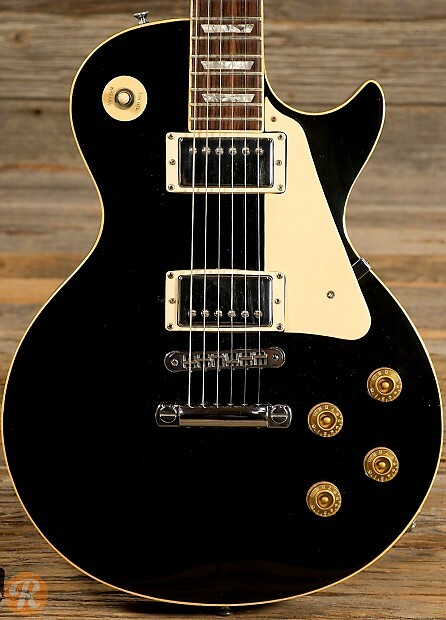 I love the cream pickguard and rings on a black LP. Every time I see one, I want it. But I must always remind myself i have a Goldtop and no justification to own 2 LP's. That's the only thing holding me back! BlueSquirrel and dbrian66 like this. All done!!! She sounds GREAT!